Finally! My EchoLink station, in the works for a month and a half, is on the air and on the Internet. If you want to give it a whirl, go right ahead! It’s listed as NØIP-R, node 695717. Granite Falls is about half-way between Madison and Redwood Falls on the left side of this map. Um, me? It hadn’t dawned on me that I could do this myself. But once Dean gave me the nudge, I was off and running (or at least hobbling enthusiastically). I thought, hey, I already have a Linux/Ubuntu server running 24/7, and I have an old Yaesu FT-1500M in a box — all I need is an interface and a radio. Finished EchoLink station. Gotta tidy up those wires! So I bought a RigBlaster Plug-n-Play USB interface from Ham Radio Outlet and a dual-band antenna off eBay from Edison Fong, hooked it all together and gave it the ol’ smoke test. It worked! 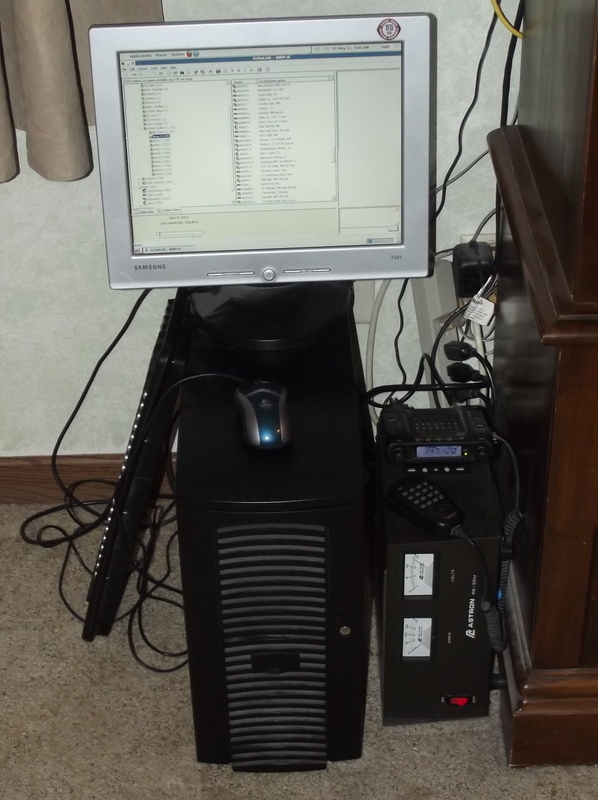 At first I just set it up on a simplex frequency and connected to the EchoLink test server, with the antenna propped up against the wall. That way I could work out a few bugs at low power and in relative privacy. The whole thing went on the back burner for about a month due to other priorities, but finally I punched some coax through the exterior wall into my bedroom. That’s where the server has been for a couple years, so that’s where the station went (I have a very patient wife!). I terminated the coax with an SO-239 bulkhead connector mounted on a blank wall-plate. On the exterior of the wall I applied hi-tech IPORS caulking compound (Individually Packaged Orally Reconstituted Sealant, i.e. chewing gum!). 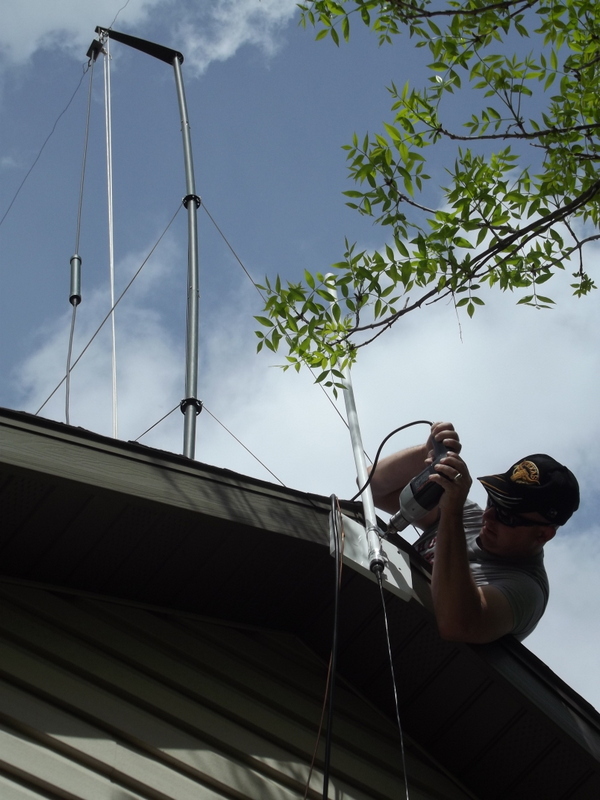 Dean Herzberg, NYØI, mounting antenna. But I just couldn’t bring myself to mount the antenna up there on the peak of my gable. Part of it is because I’m slightly handicapped, but mostly it’s because I would rather give up my ham license than go to the edge of my roof up that high. NYØI to the rescue! I’ve written about Dean before on this blog. He’s a great guy who would give you the shirt off his back. Well, Dean came over a couple days ago and put up my antenna for me, then joined my family for lunch. He’s a MN State Trooper and I’m an ex-cop from the Twin Cities, so we had plenty in common to talk about. I’ve had to fiddle with the settings in EchoLink to get it to work right, but it seems to finally be working great. The two hardest things to get right were decoding DTMF tones properly and keeping two repeaters from chasing their tails when EchoLinked. After finally figuring out the right DTMF settings, I nearly pulled my hair out trying to test them with my HT. Finally I realized that I was de-sensing my Yaesu FT-1500M every time I transmitted with my HT! When I went a block away, it worked fine. 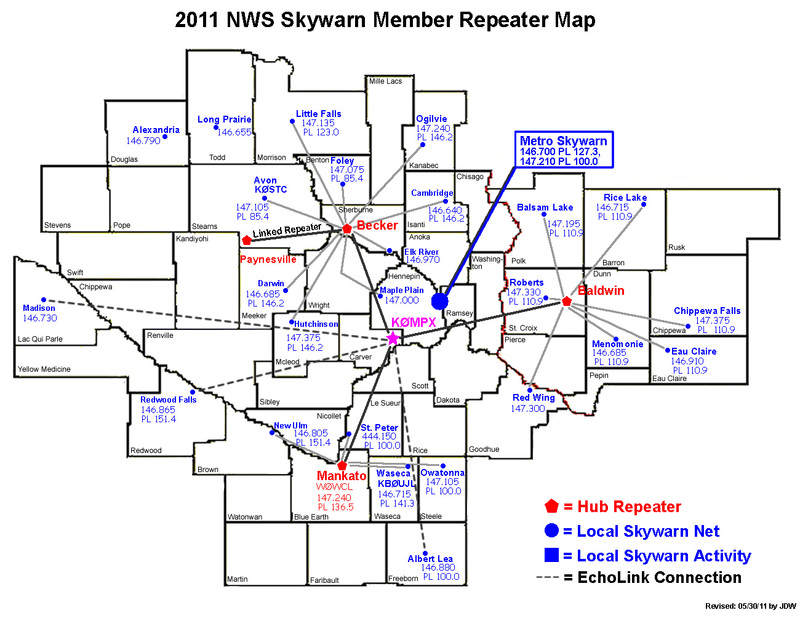 Now the National Weather Service office can EchoLink directly to Dean’s repeater so that they can hear SKYWARN spotters here in Granite Falls. Alternatively we can link his repeater with the repeater in Madison, to which the NWS already EchoLinks during severe weather — all you have to do is punch in the right DTMF code, and my EchoLink station will dutifully link them up. Now I just need to get a better smartphone so I can run that EchoLink app . . .